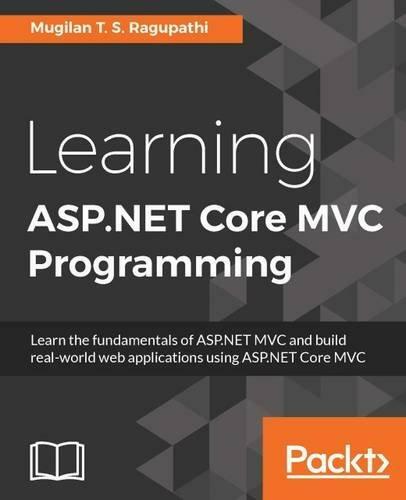 Learn the fundamentals of ASP.NET MVC and build real-world web applications using ASP.NET Core MVC About This Book * Get a first-principles coverage of ASP.NET MVC and the latest release, Core * This book is uniquely designed for developers who are looking to transition their skills into the .NET development field * The standalone chapter structure leaves you free to explore ASP.NET MVC to immediately solve your pain points Who This Book Is For This book is for developers who want to learn to build web applications using ASP.NET Core, developers who want to make a career building web applications using Microsoft technology, and developers who are working in Ruby on Rails or other web frameworks and want to learn ASP.NET Core MVC. No knowledge of the ASP.NET platform or the .NET platform is required. Even though you do not need to have experience in C#, an understanding of the basic constructs (loops, conditionals, classes, and objects) of any modern programming language would be helpful. What You Will Learn * Get to know the concepts of ASP.N ET MVC and build a new static web page using HTML, CSS, and jQuery * Set up a development environment and run a sample application using the template * Create a Controller with action methods * Build a view using several features of the Razor View engine * Construct a Model for ASP.NET Core MVC application * Devise a custom mechanism to provide maximum flexibility to your application through routing * Validate the user input on the client side using jQuery * Enhance your applications using Bootstrap * Explore new configuration and deployment scenarios-step by step guide to deploying ASP.NET Core web application in Linux In Detail ASP.NET Core MVC helps you build robust web applications using the Model-View-Controller design. This guide will help you in building applications which can be deployed on non-windows platforms such as Linux. In today's age, it is crucial that you possess the ability to separate the programming and business logic, and this is exactly what ASP.NET Core MVC application will help you achieve. This version comes with a number of improvements that enable fast, TDD-friendly development to create sophisticated applications. You would also learn the fundamentals of Entity framework and on how to use the same in ASP.NET Core web applications. The book presents the fundamentals and philosophies of ASP.NET Core. Starting with an overview of the MVC pattern, we quickly dive into the aspects that you need to know to get started with ASP.NET. You will learn about the core architecture of model, view, and control. Integrating your application with Bootstrap, validating user input, interacting with databases, and deploying your application are some of the things that you will be able to execute with this fast-paced guide. The end of the book will test your knowledge as you build a fully working sample application using the skills you've learned throughout the book. Style and approach This book takes a first-principles approach to help you understand and implement ASP.NET MVC solutions. It is focused primarily on giving you practical skills rather than the old conventional theoretical teaching.